Let us give credit where credit is due: the Chasselas is also the calling card of the wine grower who brings up it. Varieties of vine: Chasselas (around 21%), Gamay (24%), Pinot Noir (11%) various varieties: Riesling Sylvaner, Chardonnay, Aligoté, Pinot Gris, Pinot Blanc. 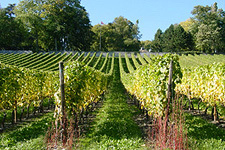 With 1400 ha, Geneva is the third wine producing canton of Switzerland. Climate: varies according to the municipalities (microclimates). Specificity: development of the typicality of the various vines. Geneva has a wine producing tradition bi-millenary and the wine growers knew how to adapt their productions to their requirements and especially to those of an attractive, curious and refined consumer. The wines appear now among the greatest. The Geneva wine producing municipalities: Satigny, Russin, Dardagny all three represent the region of Mandement on the right side of the Rhône and Lake Geneva. It covers 3830 ha and 6 regions - Vully, Bonvillars, Côtes-de-l’Orbe, La Côte, Lavaux, Chablais – each one corresponds to a typography and a very precise climatology. 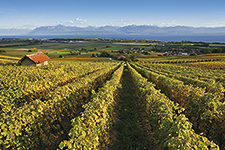 The Vaud vineyard produces mainly Chasselas (60.1%). LA COTE: A life of castels ! The vineyard extents from Nyon to Lausanne covering 2000 ha that is 52.6% of the Vaud wine producing surface. It is protected by the Jura chain and takes advantage of the thermal regulating effect of Lake Geneva. Wines are different according to the nature of the ground: they are fine in the rocky ground of the low plots and robust in the heavy ground of the hillside. They have floral aromas and a fruity flavour. LAVAUX: 736 ha that is 19.4% of the Vaud wine producing surface, from Lausanne to Chillon. With its characteristic terraces the grapes benefit from the sun reverberated by the lake and the walls. Wines are structured, complex and persistent with honey and toasted flavours. 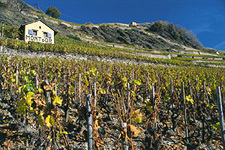 The Lavaux terrace vineyards are registered on the UNESCO world heritage. 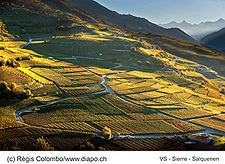 CHABLAIS: 583 ha that is 15.33% of the Vaud wine producing surface, from Villeneuse to the border of Valais. The ground is stony and the vineyard benefits from the foehn. Wines are racy, powerful and perfumed with a characteristic flint flavour. NORD VAUDOIS: Vully, Côtes-de-l’Orbe, Bonvillars. 413 ha that is 10.9% of the Vaud wine producing surface. Bonvillars is situated on the bank of the Neuchâtel Lake of which it benefits from the microclimate. Vully the vineyard is partially on the cantons of Vaud (46 ha) and Fribourg (104 ha), on the slopes of Mont Vully. The ground is made of sandstone and marl. Les Côtes-de-l’Orbe: is situated halfway between Lake Geneva and of Lake of Neuchâtel from La Sarraz to Yverdon-les-Bains. 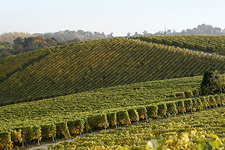 Specificity: the native vines are emphasized. The white wine Chasselas is called Fendant and the red wine Dôle (blending of Pinot Noir and Gamay). White varieties of vine: Chasselas (Fendant), Johannisberg (Sylvaner), Malvoisie (Pinot Gris), Muscat, Chardonnay, Ermitage (Marsanne Blanche), Petite Arvine, Amigne, Heida/Païen, Pinot Blanc, Humagne Blanche. 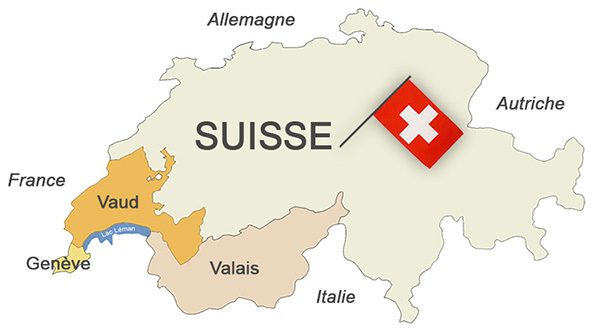 The Valais is the first wine producing canton of Switzerland (4842 ha and 120000 plots of land). It is unique by the diversity and the potential of its traditional wines. The Valais has the biggest diversity of grounds in Switzerland what favours the adequacy of vines and climate and creates exceptional wines. 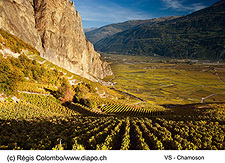 A quality follow-up of the vineyards ensures the unique character of the Valais wines. The Valais has a dry climate with a generous period of sunshine, ideal for the maturity of the grape. 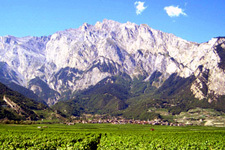 In autumn, the foehn (dry wind) creates strong thermal amplitudes between daytime and night, well for the maturity and the sanitary state of grapes.